Dieses schöne Haus im Zentrum von Paris befindet sich am linken Seine-Ufer, nur 5 Gehminuten vom Jardin du Luxembourg und nur wenige Gehminuten vom Louvre und dem Musée d'Orsay entfernt. Es ist sehr ruhig und sicher. Das Haus hat seinen eigenen Eingang in einem schönen, blühenden Garten und ist auf vier Ebenen (2200 Quadratfuß) mit einer Terrasse mit Blick auf die Dächer verteilt. Wohnzimmer, Küche, Esszimmer und ein Badezimmer sind im Erdgeschoss, sehr groß für amerikanische Verhältnisse. Auf der ersten Etage, zwei Schlafzimmer, eines mit einem Doppelbett, das andere mit zwei Einzelbetten, eine Toilette und eine Dusche. Ein Erwachsener kann bequem schlafen zwei Jugendliche sind in Ordnung, die Einzelbetten sind normale Betten, aber das Zimmer ist nicht sehr groß. Auf der zweiten Etage, ein Schlafzimmer mit einem Kingsize-Bett, ein separates WC und ein Badezimmer. Auf der dritten Etage, ein weiteres Wohnzimmer mit TV und Stereoanlage und die Terrasse. Dieses moderne, elegante Haus ist für jeden Besucher in Paris am bequemsten. Es gibt viele wunderbare Restaurants, Cafés und Geschäfte in der Umgebung. Freiluftmärkte für jeden, der gerne in der großen und sehr gut ausgestatteten Küche kocht. Ein idealer Ort für die Woche. Very welcoming, artistic, eclectic, clean, spacious & well-kept townhouse on 4 floors. Lots of room for people to spread out. The eating area & kitchen are comfortable & well-equipped. Beds are firmly comfortable - though the trundle bed in the single room fits so tightly it was impossible to move in the room. We moved the 2nd bed into the spacious hall. The toilets, showers & baths are all in separate rooms; odd for N Americans, but very functional for a group. We were there in October and the weather was perfect. I don't think there is a/c, however. Location is excellent; close to Denfert-Rochereau, a key station for connecting to CDG. And the best patisserie in Paris is just around the corner at Raspail station. The floors are beautiful old oak, although waxed and very slippery in socks, so bring non-slip slippers or go barefoot, especially on the stairs. (No shoes in the house.) The house is not suitable for people with difficulty on stairs, nor for children who can't be trusted with books and artwork. Annette is very responsive, and you will be greeted by 2 inquisitive cats in the courtyard, Theo and Nelson. I highly recommend this home for mobile people who appreciate art and can be respectful of homes with antiques, books, and fine furniture. We stayed in this apartment for our visit to Paris in June 2018. The owner is great and very easy to work with and took care of all issues before and after arrival. The apartment is very quiet and in a less busy part of Paris. It is very close to public transportation so very easy to get around. You can also walk to many places like Notre Dame. Our family enjoyed the three bedrooms. We were out doing tourist things all day and really appreciated the quiet for sleeping at night. Our place in London was on a loud busy street. There is no street noise at this apartment. I highly recommend this for a great stay in Paris! Lovely home & great location! My family and I spent a wonderful week at Annette's house in Paris! It was 4 adults and two young children. We had more than enough space so we weren't on top of each other. There were three separate bathrooms and three bedrooms over four floors. The kids loved exploring the funky space and we all enjoyed their extensive book collection. The location cannot be beat. We walked to Luxembourg Gardens almost every day. We were close to many public transportation options; we could get everywhere from Annette's house! Annette was also very responsive, which was a change of pace from some other places we've stayed. 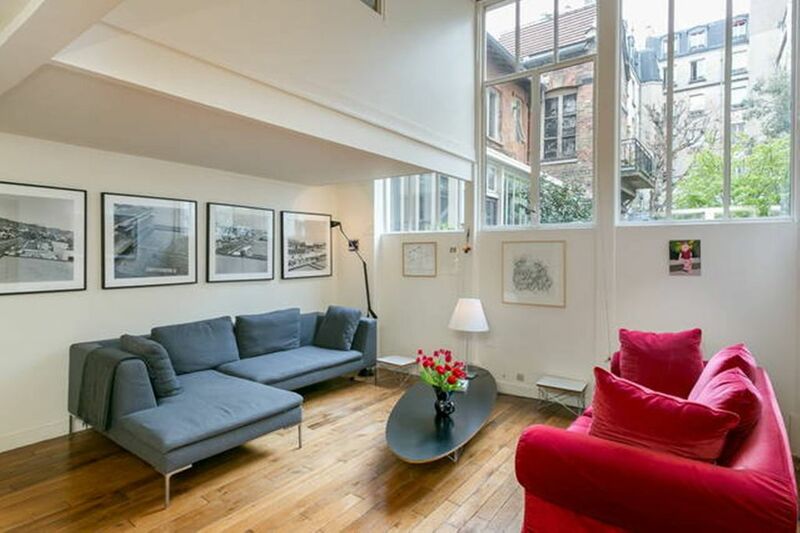 Amazing size, tranquil right in the heart of Paris! We loved our stay at Annette's house - yes, a house in the centre of Paris! Quiet and with lots of room to move for 3 adults and 3 children (two 7-year olds and a 3 year-old), the location is a short walk away from the Luxembourg Gardens, the Metro and shops. Annette was very responsive, and great with communication. Would happily recommend to friends and family. My husband, two teenagers (14 & 16) and I stayed in this beautiful home for 4 days in mid-July '15. We were blown away by the space (in Paris!!) for all of us and the tastefulness of the very personal design of this home. THIS place is how you decorate with your collections! The space in this home and the fantastic kitchen made it a pleasure to get up and go each morning - no stepping on top of each other for bathroom space; a cinch to throw together a nice breakfast and eat it in a comfortable way - and then a perfect place to come back to after a long day of tromping around in the hustle-bustle of the city. The courtyard kept all street noise at bay, and we could all retreat to our own comfortable spaces for a bit of respite, before going out again in the evening to explore or hit any of the great recommendations Annette thoughtfully provides. I felt happy and inspired in Annette and Luc's special home and would love to go back again some day. I would not return in the summer, however. All of Paris was suffering in the great heat of the week we were there, but in spite of the fans kindly provided, the upper, bedroom floors were terribly hot in the evenings, as despite fantastic windows, there is little to no cross ventilation. This was a problem for us. One more note, as the previous reviewer mentioned, the beautifully maintained old floors can be quite slippery in the requested stocking feet, and all of us slipped and slid a bit. With no handrails on the stairs, this might definitely be a concern for seniors or small kids. With these notes in mind, I would not hesitate to return to this very special home in Fall, Winter or Spring, and have already recommended it very enthusiastically to friends and family. We booked this house for a family of 6, including a 65-year-old grandmother and 4-year old twins. The house is spacious and well located and a very good deal compared to the price of finding a hotel suite or group of rooms that could sleep 6. The neighborhood is wonderful, full of lively cafes, restaurants, shops etc and easy access to the RER and metro, but the house itself is located in a peaceful courtyard off a quiet side street - best of both worlds. Luxembourg Gardens are a short walk away, and with playgrounds, carousel, toy sailboats etc it's a great location for families with children. Best aspects of the house include the location, spaciousness and quirky quasi-existentialist art throughout. In addition Annette was very responsive to email inquiries and accommodating to our request to check in early in the morning after an overnight flight from the U.S. A few small annoyances: huge windows in the master bedroom with no window coverings, which in summer makes the room extremely bright and difficult for sleeping (would not be a problem in other seasons with less daylight); relative lack of space to unpack (owners live here when not renting so most drawers and closets are full of their belongings); and less than ideal cleaning in advance of our arrival (half full coffee cup left on railing; perishable food left in refrigerator; ants on floor of master bedroom- none of which are a huge deal but annoying given the compulsory 150 euro cleaning fee). Staircases were fine for our 4-year olds but would be a bit harrowing for young toddlers. These are all minor complaints. Overall the house offers good value for money and a great location, and I would recommend it for families or small groups as a comfortable and spacious hotel alternative.